Ultra soft, outstandingly warm, and impressively lightweight, this excellent blanket is made from premium nylon flock that's as cozy as it is stylish. Machine washable convenience and self-binding edging ensure a long-lasting and resilient addition to your home for years to come. Though labeled a queen-size, the width is just adequate. It could have used another six inches for comfort's sake. I also found the vellux more coarse than my other vellux blankets. However, It is dense and holds the warmth in beautifully. I am in love with the plum rose color. These blankets are light but very warm. It's the Vellux material. I hope Vellux comes out with more unusual colors like the plum rose. I would buy them! I have a full size bed so ordered a full/queen but it was too big and would hang out under the other covers so I cut off 8 inches from the side and hemmed it. Now looks good! There is no "plush" in this "microplush" blanke and the color is definitely not true to the photo. It's greyish. The fabric is abrasive against the skin and scratches it. I was shocked as most Vellux blankets are soft and well made. This one feels like it came from a dollar store and has irregular stitching. Did not feel like shipping it back, so donated to Goodwill. This blanket is great quality and a good value. It's very soft, true to color and fits well on the bed for the size we ordered. After the initial wash/dry of the blanket we haven't had any lint problems, as expressed by some review posts. 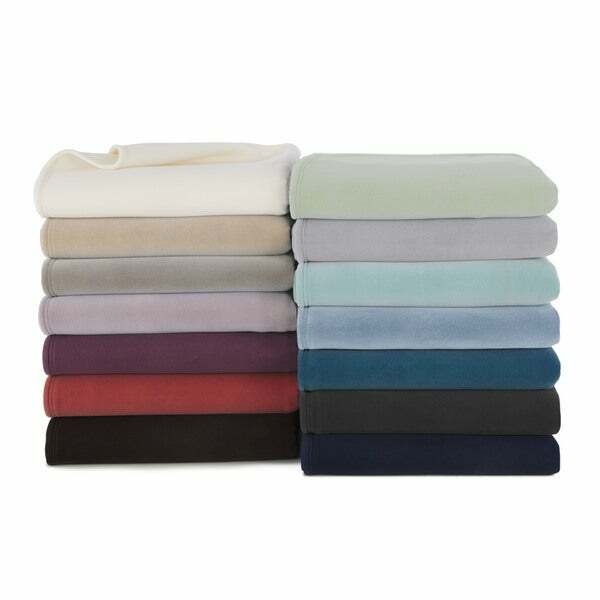 Would highly recommend this blanket, especially given the wide variety of colors available. Soft,can be used all year long, and lasts years!! Did I mention soft? I ordered the Mauve color and really like it. It is kind of muted and -almost a dark pink. Wash it first before putting on bed--helps get rid of slight plastic smell and to soften the fibers up. I am using it as a bedspread during the summer months. I took my comforter off and just use this -with a sheet is perfect. Not heavy and not real warm but it is soft and keeps the cool air conditioner air / fan off you . The last one I had lasted 20 years (amazing since hardly nothing now days last very long) -hope this one does too. It does feel like it is a might thinner but NOT FOR SURE since my old was washed so much ....it is hard to tell. Great blanket---worth the money. Thought it was time to replace my old, comfortable, broken in blanket that has seen better days. Much to my surprise, this blanket is not only beautiful, but soft and just makes me want to roll myself up in it. Haven't washed it yet, but I suspect it will be fine. Would buy another one in a heartbeat. Vellux IS the original microfleece blanket!!! When preparing Mom's 'apartment' at the Memory Care residence, we had to find every piece of furniture, bedding, etc. she would need. Purchasing this Vellux blanket was truly the only item I did not hesitate over. I've had Vellux blankets as well as other fleece/microplush coverings over the years. All the original Vellux blankets have been fabulous! They wash well, never fade and are always a 'go to' choice. Vellux blankets are soft, cool for those who overheat and warm when another blanket is on top. Mom is always cold and this beautiful blanket keeps her nice and toasty with a comforter over it. The only caution is to NEVER use bleach with Vellux blankets. I washed and dried in high heat, didn't shrink. If your warm blooded it's not for you. I'm normally cold and I love it . It feels grate. True to size. Good purchase . Looked and felt like a piece of foam . . .
Don't bother purchasing this blanket. When I opened the pkg, I was shocked to first see it looked like a piece of foam. Then after feeling it, it felt just like foam... Sending it back asap. This blanket is neither too heavy, not too light - it is JUST RIGHT! Updating review: didn’t realize one of the blankets has a whole chunk/ layer ripped off in the corner. I guess other reviews were right. Within 3 days this blanket had small "hole" areas where the material is missing. I did not wash it prior to placing it on our bed, we weren't using it for sleep coverage as the weather was still warm, and it was covered by a comforter during the day...yet "holes" started appearing. Very unhappy. Will be researching for a replacement, and will not be purchasing a Vellux again. Nice medium weight blanket. I ordered the dusty rose and it looks different but it's still a shade of light pink. Not the prettiest either. The blanket is not as soft as I was hoping it would be. I bought one a few years ago and it was a totally different blanket. One good thing is the twin blanket is huge. It has no issue covering the bed. I love this blanket. We later them on our beds in the winter. They add warmth and are very easy to wash. I do not put them in the dryer, it makes them weird. Line dry and it will stay like new for a very long time. I have loved Vellux blankets for years. They are so soft and warm, yet very lightweight. I ordred the blue and we love it. These feel amazing. I would definitely recommend these. Product is as pictured and described. I ordered the chocolate color and it is exactly what I was expecting. You can't go wrong with Vellux! I would recommend to a friend. I loved the colour on the picture but I was disappointed when I received the actual item. The blanket smelled so I washed it and when it was washed and dried (on warm wash and dry) the texture was harsh, not soft like a normal vellux usually is. I am sorry to leave this review but I wanted a vellux blanket to match the sheets I had just purchased. The vellux blanket I bought years ago still feels soft and nice and it's ten years old! This is my all time favorite blanket. I use them until they are unusable! This one has a hem on all 4 sides. The ones I've gotten in the past only had a hem on the top and bottom. Much better with all 4 sides hemmed. I always buy Vellux! Have for 25 years. Great price Overstock! Thanks! I am so happy to have Vellux blankets again. I washed and dried them and they seem to be as comfortable while sleeping as the brand did years ago. I don't know if they were made in China years ago, but these were. I had a lot of white, almost powdery lint in my dryer filter with each blanket after drying them. I am hoping it is not indicative of how they wear over time. "So, there are TWO sizes listed for “FULL”/“QUEEN” ... a “Full/Queen”(with slash mark) AND “FULL-QUEEN” (with dash mark) I have a Queen sized bed, ADORE these blankets, and MUST order one, but I need one that fits!!!! Please advise me! AGAIN, I have a Queen bed. Thanx!!! Jan"
This is a full/queen blanket and the dimensions are 90 inches wide x 90 inches long. "Looking for King size Electric Blanket with two controls. Do you carry these?" Perhaps ITEM# 19202726 would work for you. "I am looking for a blanket that is not to heavy. " I've used these blankets for years and find them very comfortable in both winter and summer. Love this one and use it year round. This blanket is light weight. "The Ivory color appears to be more a pale yellow. Is that true? Please advise." The Ivory is a true ivory color. Please see the third photo for a closer image. I have the ivory. It's not yellowish at all. I like these blankets. The weight is perfect- not too heavy or too light. I ordered from you because I can't find them in stores anymore. "Where are these blankets manufactured? Thanks!" Hello vssy, these blankets are made in China. I hope this helps. Please let us know if you have any additional questions. Thank you for shopping with us! "How long is the King Blanket?" Thank you for contacting us, mopsie50. King dimensions are approximately: 106 inches wide x 90 inches long. Please let us know if you have any further questions.